The ancient art of Qawwali is centuries old. Although Qawwali is becoming an increasingly popular genre in World Music, there are some beautiful Qawwalis which are not as exposed. Songs of love, both requited and unrequited, Qawwali has been a special form of music for expressing a mystical emotion. We searched out 5 not so well known Qawwalis for you to get to know. This Qawwali sings of the intense separation from the Beloved, Krishna. The lover asks, “Tell me Krishna, do you remember me at all?” The mood of intense love and separation is an important part of the Bhakti (devotional) tradition. This devotional song was written by Nawab Sadiq Jang Hilm of Hyderabad. Sung by acclaimed Qawwals Fariduddin Ayaz & Abu Mohammed, this Qawwali describes the marvels of God walking on Earth in human form. The theme of the individual being dependent on God’s will and the exploration of leela, or divine play, are the theme of this Qawwali. Fariduddin Ayaz, Abu Mohammed and party perform “Ae Ri Sakhiri Morey”. This Qawwali is a composition by Amir Khusro, the founder of Qawwali. Khusro sings in praise of his beloved master in the mood of devotion and longing. Aziz Mian is a Qawwali icon. He was the only prominent Qawal to write his own lyrics. His raspy voice made him a distinctive Qawal. In this qawwali, “Teri Soorat Nigahon Mein”, the lover expresses utmost loyalty to the Beloved: I died, but my eyes refused to close. That was the height of waiting. The fifth Qawwali chosen is by the iconic and arguably most well known Qawwal, Nusrat Fateh Ali Khan. In the Qawwali, Sohne Mukhre De Lain De Nazara, the lover asks the Beloved, what will it cost to catch a glance of your beautiful face? We are looking forward to presenting the torchbearers of the Qawwali tradition, Rizwan-Muazzam Qawwals in concert this March. The nephews of the great Nusrat Fateh Ali Khan will be performing in 8 different cities across the UK. 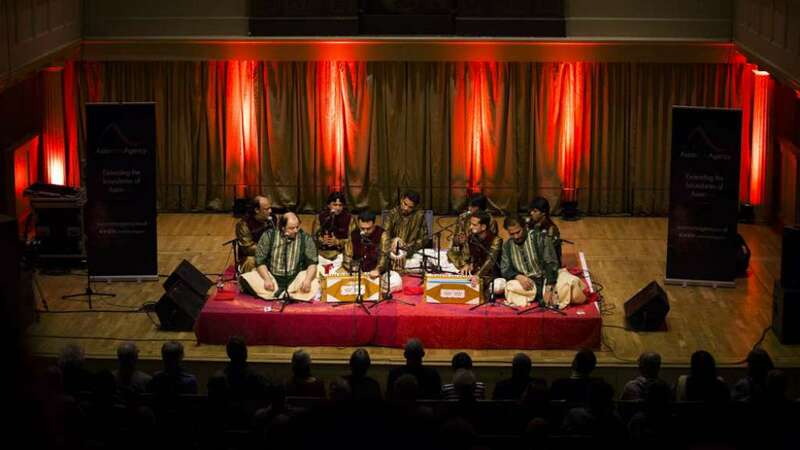 We hope you can join us and experience the magic of Qawwali, live in the UK!